Facebook is one of the most powerful marketing platforms in use today, so it's important to understand how you can use it to attract more customers to your company. Here at XEN, we are dedicated to making your life as easy as possible. That's why we've created this Ebook - to guide you through the best uses of Facebook for your business and your goals. 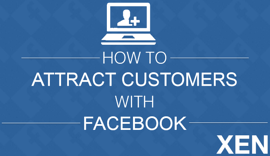 This free 74-page Ebook provides some helpful insights into attracting customers with Facebook.